Genesis Duke Nukem 3D (Brazil) in 20:03.75 by Dimon12321. 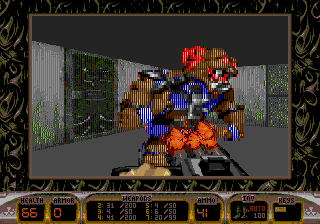 This version of Duke Nukem 3D was released exclusively in Brazil. The gameplay is fundamentally the same and has the player blasting invading aliens from Duke's point of view. It consists of nine levels based on the PC's Lunar Apocalypse episode and a range of enemies and weapons from the original game. The difficulty has been raised significantly, and the framerate is noticeably reduced. The port also makes heavy use of scanlines and a smaller window size to reduce the overall render load. Dimon12321 follows the fastest path through each of the maps, and moves extra quickly by running and strafing at the same time.